During the Depression and into the 1950s, Métis political organizations were particularly active in Alberta and Saskatchewan. In the 1930s, northern Métis began to organize politically to counter government and church paternalism and to take a stance against fur buyers who did not always give Métis trappers the best prices for their furs. Métis established fur and fish cooperatives in northern Saskatchewan and Manitoba to help make a better living. However, many northern Métis, if not most, were living in grinding poverty. The Northern Halfbreed Association was founded in northern Manitoba in the 1930s to alleviate Métis poverty. In 1940, the Métis Association of Alberta was founded, and in the 1940s, the Saskatchewan government provided funding for the Saskatchewan Métis Society (originally founded in 1935 as the “Half-breeds of Saskatchewan”). Within Saskatchewan, there were northern and southern Métis political organizations during the 1940s-1960s (the two organizations merged in 1967). Following the Second World War, the Métis were in a precarious state. Many had begun to move into the cities after living on road allowances in makeshift squatting communities. The Métis had a predilection towards wage labour, and cities were becoming increasingly important as places of employment during the post-war boom of the 1950s. The Métis were part of the larger Indigenous migration to the cities, since reserves and road allowance communities provided few opportunities. Even though Indigenous peoples have had a long presence in Western Canadian cities, for many Métis the urban cultural landscape seemed alien and disjointed from their lives in rural and northern areas. Still, during these migrations to the cities, kinship networks were re-established and families began to reconnect. Nonetheless, racism in the cities meant Indigenous people struggled to find housing, jobs, and educational and social services. To counteract these realities, Indigenous people began to organize and lobby for services from various levels of government to assist with their integration into urban life. Métis in Winnipeg were instrumental in setting up the Indian and Métis Friendship Centre of Winnipeg in 1959. Similar organizations were opened in a number of Prairie cities and towns. By 1972, all of the Indian and Métis Friendship Centres across Canada formed the National Association of Friendship Centres. 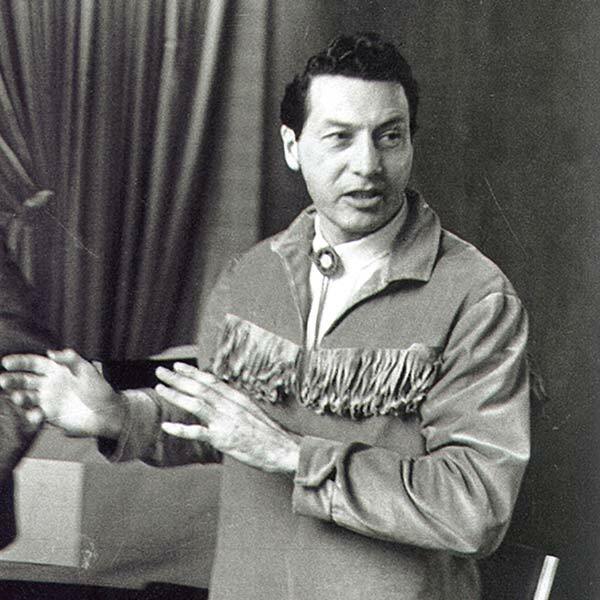 During the 1950s, the Manitoba Métis also worked with the province’s First Nations to hold annual Indian and Métis conferences. However, in 1967, Manitoba Métis founded their own organization, the Manitoba Métis Federation. The Ontario Métis and Non-Status Indian Association was founded in 1965 in northern Ontario, as was the Robinson-Superior Métis Association. In the 1970s, the Métis in the Peace River regional district of British Columbia founded the Louis Riel Métis Society (later spreading province-wide in 1983 and changing its name to the Louis Riel Métis Association of British Columbia). During the 1960s, the American Indian and civil rights movements provided examples to the Métis and other Indigenous Peoples on how to address their colonization and marginalization. Various books and pieces also had a great impact on Métis activism at this time, including Chief Dan George’s Lament for Confederation (1967) and Harold Cardinal’s The Unjust Society (1969). These stinging rebukes of government Indigenous policy and colonization were further reflected in Métis polemicist Howard Adams’ Prison of Grass (1975) and in Maria Campbell’s Half-Breed (1973), the latter chronicling the visceral racism that ground down Campbell’s Métis community and family. Indigenous-based publications such as New Breed magazine, the magazine of Saskatchewan’s Métis and non-status Indians, also contributed to the Indigenous rights cause, providing useful information to community members in the struggle against government and societal racism and colonization. Howard Adams, the late prominent Métis activist. In 1975, the Saskatchewan Métis Association changed its name to the Association of Métis and Non-Status Indians of Saskatchewan to reflect the inclusion of non-status Indians within the movement. Non-status Indians also filled the ranks of Métis organizations in Alberta and Manitoba, as the Métis and non-status Indians had a common cause since their rights as Indigenous peoples were also ignored by government. The Métis political movements at this time focused on Métis housing, employment, education, and education training. Education was a primary concern for the Association of Métis and Non-Status Indians of Saskatchewan. In 1976, it held a cultural conference that led to the creation of the Gabriel Dumont Institute in 1980. The creation of the institute was a result of community-based activism. Hundreds of Métis community members had sit-ins in the legislature in Regina and in other government buildings to compel the government to create the institute. Many Métis and non-status community members were also involved in trying to stop the Adopt Indian and Métis program, a Sixties Scoop campaign of the Saskatchewan government that took Indigenous children away from their families and communities. In Alberta, Métis community activists formed the Alberta Federation of Métis Settlements Associations to fight for self-government for the settlements. After 15 years of struggle, their aspirations were realized in 1990 when the Alberta government passed acts that gave the community self-government and control of their land base. 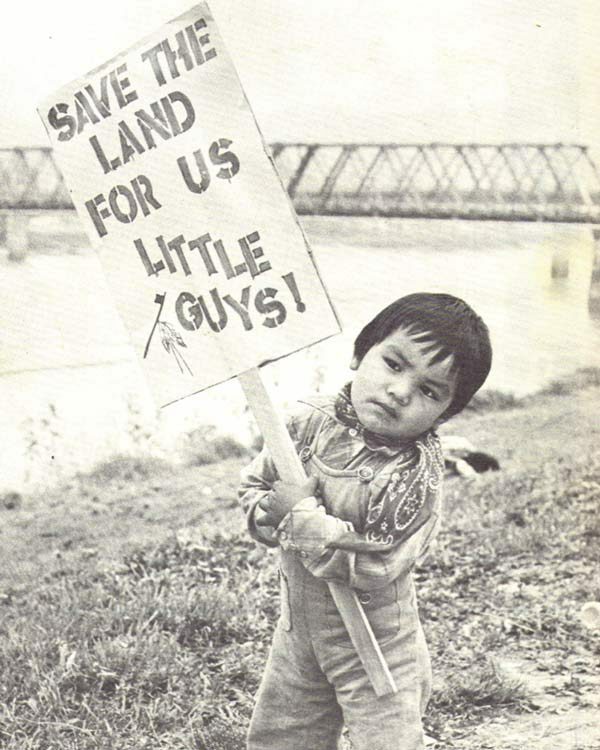 Photo of an unidentified Métis child taken during a protest in the fall of 1976. In Manitoba, the Manitoba Métis Federation and its membership were involved in a number of social justice causes in the 1970s. One of the most famous was a protest against institutional discrimination in a school district in Camperville, Man. in 1973. The MMF also picketed and held sit-ins at government offices and Crown corporation offices to fight discrimination in these agencies and to ensure a more representative Métis workforce within them. Community members relieved protestors and picketers (giving them a necessary break) and provided them with food and drink. During the 1970s, Métis political organizations also began to wrestle some funding from government to ameliorate the Métis’ social displacement. With this funding, the Métis political organizations hired field workers to partner with Métis communities to assess what sorts of programs were required at the community level. Not surprisingly, housing, employment training, basic education, skills training, and cultural programming were the main programs established in the 1970s by Métis political organizations. On the national level, the Métis had been represented by the National Indian Brotherhood since the 1950s. In 1971, the Native Council of Canada was founded to represent the Métis and non-status Indians. The main concern of the NCC was to get the federal government to recognize the Métis’ Indigenous rights and recognize them as a rights-bearing Indigenous people. The culmination of these efforts came in 1982 after the NCC’s Harry Daniels lobbied to get the Métis recognized as one of Canada’s three Aboriginal peoples in the Canadian Constitution. Many Métis consider the 1960s and ’70s to be the golden era of Métis grassroots activism. It had a unity of purpose whereby all community members seemed united in having a common set of goals.